Which film do you think will WIN the coverted BEST PICTURE award at the upcoming ACADEMY AWARDS? If you think that you know - why not enter our competition at Sutherland Library? The first correct entry drawn will WIN a double pass to the movies at Greater Union cinemas. Will it be the extremely successful sci-fi Avatar, or the tough but ultimately uplifting Precious. Maybe the quirky Inglorious Basterds or the tense war drama The Hurt Locker? A full list of nominated movies is provided on your enrty. The competition closes at 4.00pm on Sunday March 7. Good luck! Wednesday, 17th February 2010. We completed another successful Summer Reading Club with the presentation of prizes. During the recent school holidays 1055 children across the Shire registered for the Reading Club and between them read almost 13,000 books. This was a terrific result. Thirty prize winners received books and vouchers donated by our sponsors. 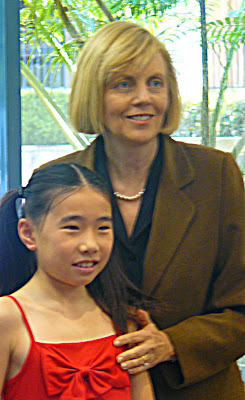 Three lucky children won major prizes. For the young ones, 0-4, a library bag of books, DVDs and CDs. For those aged 5-8 years, a digital camera, and for 9 - 12 year olds, an Ipod Nano. The excited winners were presented with their prizes by The Mayor, Councillor Lorraine Kellyand Mr Graham Hill, president of The Tradies. We would like to thank all our sponsors: The Tradies; Sutherland Shire Leisure Centres; AES Library Supplies; Bloomin' Books, Caringbah; Sydney Tramway Museum; Hazelhurst Regional Gallery; Child's Play Australia; The National Maritime Museum; The Ridge Golf Course and Driving Range. The Teen Summer Reading Club presentation was also held on the same day. An amazing 974 books were read by the 111 teens who participated during the school holidays. Books, Gift Vouchers and Ridge Golf Course vouchers were given away weekly. 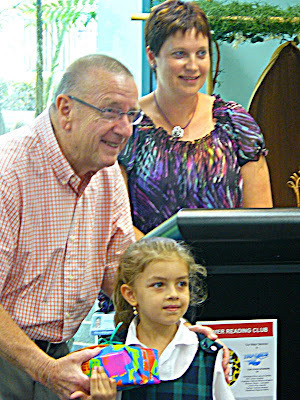 The major prize of an IPOD Nano was given away at our presentation on 17 February. It was great to see so many of our teens reading throughout the holidays. Do you love to knit or have you ever wanted to learn? Do you want to help to keep this wonderful skill alive and have a friendly chat over a cuppa. Then head to Sylvania Library. Knitters and would-be-knitters are welcome to come and spend some time working on their projects in a relaxing, social setting. "Researchers at Harvard Medical School Mind and Body Institute have found that the average person's heart rate drops 11 beats per minute while knitting and that you get a sense of calm similar to that associated with meditation". There is much evidence in literature that massaging your baby has many physical and neurological benefits. Engadine Library is pleased to be hosting a 1 hour introductory session on basic massage techniques. Briony Howland, a nutritionist, doula and massage therapist will be discussing how to recognise when your baby does and doesn't want massage and appropriate oils for infant and childhood massage. As this session will be hands on, there will be a limit of 10 parents and their babies. Parents will need to bring their own towel and some massage oil for their baby. Safer Internet Day 2010 is an international event which aims to raise awareness about the safe and responsible use of online technologies - especially amongst children and young people. Safer Internet Day 2010 is on Tuesday 9th February with the theme being 'Think Before You Post'. Think Before You Post is an important message for children and young people, both for their Internet and mobile phone use. A simple technique of stopping to think about the consequences before sending or posting information may help to reduce negative experiences. For more information and tips about the sharing information that could be seen by those other than people that you know go to the Australian Government's Cybersmart site. Your digital footprint could be forever. 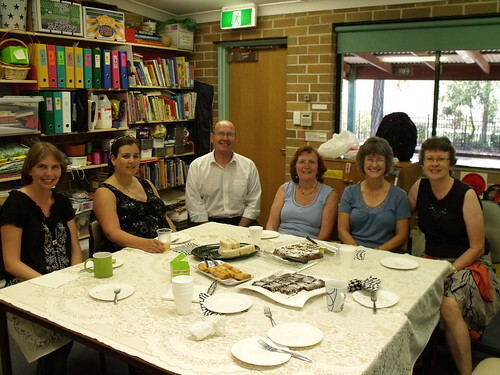 Amy 's Farewell Lunch, originally uploaded by Sutherland Shire Libraries. On Friday (22nd!) we had a farewell lunch for Amy. Plenty of yummy food was lovingly prepared the night before by Kelly, Jeanette and Andrea (who actually made 3 different treats!). We will all miss Amy very much and wish her well with bubba number 3.